Kingpin understand that the cable gland sector is highly specialised, and therefore made to measure, exact cable gland accessories are vital. As we have been working with the industry for many years, Kingpin believe we provide the best cable gland accessories and products around. Earth tags are Kingpin’s signature cable gland accessory. These small components are paramount to the safety of the cable gland, providing an earthing point for the electricity flowing through them. Brass is the industry standard, but we offer our earth tags in various other materials, including aluminium, nickel and stainless steel. Whatever conditions your earth tag has to match, we can provide it. This claim is also backed up by our wide variety of sizes to choose from, from M16 to M130. Click here to learn more. Our range of locknuts are purpose built to secure the cable gland in place, ensuring it won’t easily be pulled apart. This therefore makes it an important part of the set up. Once again, whilst brass is the industry standard, we are also capable of making locknuts in aluminium, BZP, nylon and stainless steel, in a massive range of sizes. We don’t just supply locknuts as cable gland accessories – various electrical companies also trust us to deliver them high quality locknuts in all shapes and sizes. 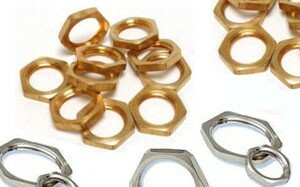 From tiny locknuts for consumer electronics, to huge locknuts for heavy industrial work, Kingpin can provide. Click here to learn more. Washers provide the vital service of maintaining and protecting the insides of the gland. This cable gland accessory will make sure that water, dirt, sand, and other contaminants don’t find their way inside and start interfering with the electrical supply. They are available in brass, fibre and nylon, in sizes M1 to M130. 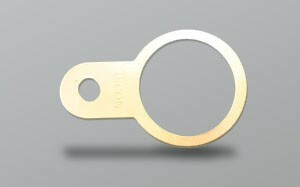 We also offer serrated washers, which provide extra protection and security for your cable glands. 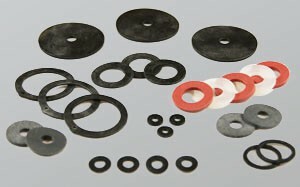 These shakeproof washers can’t be shook lose by heavy vibrations, making them vital for heavy industrial work. Our washers are even trusted to keep cable glands, and other piece of electrical equipment, protected while in use at off-shore oil rigs! So big or small, you can trust Kingpin to manufacture the most elite washers money can buy. Click here to learn more. Click on any of these cable gland accessories to find out more. All of our products are made to your specifications, so you can trust Kingpin to produce the perfect part for the job, 100% of the time. We also pride ourselves on our industry leading turnaround times, so you won’t be waiting a ludicrous amount of time before your product is delivered, whether it’s a one off or an order numbering in the thousands. Kingpin want to be your number one choice for cable gland accessories. We believe that our combination of efficiency, quality and price makes us the best supplier around. If you would like to enquire about our services and see what Kingpin can do for you, please phone us on 0121 559 7742, or get in touch via our Contact Page.